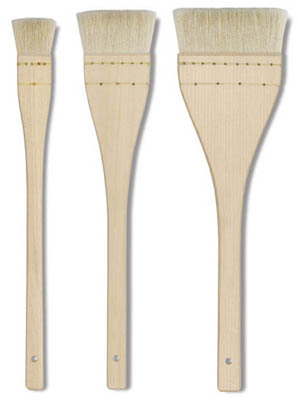 Hake Brushes are unique, flat, wide brushes, ideal for applying media over large areas, wash sizing, gluing and dusting. The flat handle and the select soft goat hair give you excellent control of the brush. They are ideal for working with Japanese papers, tissues adhesives and dusting. Our CSS Hake Brush is made of top quality, soft white goat hair. The hair is set in a bundle, that is then hand bound with synthetic thread in a flat, unfinished, split wood handle. The handle is approx. 10" in length. The hair length is 1-1/4" for all sizes. This brush contains no metal parts or sharp edges that could scratch a surface during use.